Sudipta and I met at Park Street and left for Sealdah to catch Ganga Sagar Express (3.40 pm departure). We are received by Sudipta of Banglanatak.com at Madhubani station and we went to the hotel in Madhubani (some of the people attending this festival are put up) for a cup of tea and left for Simri region by Sumo. Mithila is an ancient cultural region of South Nepal and North India lying between the lower ranges of the Himalayas and the Ganges River. The Gandak and Kosi River are in two sides of Mithila. The Ramayana records a marriage between Ram of Ayodhya and Sita, the daughter of Raja Janak of Mithila. Begusarai, Bhagalpur, Darbhanga, East Champaran, Khagaria, Madhepura, Madhubani, Munger, Muzaffarpur, Saharsa, Samastipur, Sheohar, Sitamarhi, Supaul, Vaishali and West Champaran. The name of the district Darbhanga has been derived from its principal town Darbhanga, which is said to have been founded by Darbhangi Khan. It is also said that the name Darbhanga was derived from Dwar-Banga or Dar-e-Bang meaning The gateway to Bengal. The district of Madhubani was carved out of the old Darbhanga district in the year 1972 as a result of reorganisation of the districts in the State. It consists of 21 Development Blocks. Bounded on the north by a hill region of Nepal and extending to the border of its parent district Darbhanga in the south, Sitamarhi in the west and Supaul in the east, Madhubani fairly represents the centre of the territory once known as Mithila and the district has maintained a distinct individuality of its own. Sitamari has a past that pre-dates history. When Sita was going to Ayodhya, She stayed and rested here. We stayed in one of the houses (roof) of the villagers (dadaji - grandfatther of Jyoti Kumari ??) , sort of vilalge chieftain of Simri. We were told that maachh ,makhan and paan - these are the identities of mithila : fish is the most popular food habit in mithila ; people like fish as a main dish in any occasion. Chuda ,dahi and chini is also most important cuisine of mithila. People like paan , in every occasion. 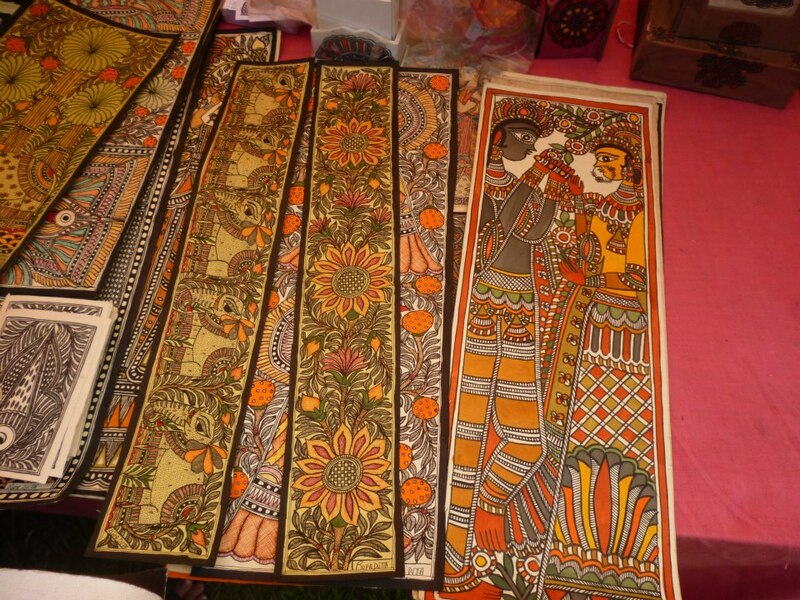 The origins of Madhubani painting or Mithala Painting are shrouded in antiquity and mythology. Madhubani painting has been done traditionally by the women of villages around the present town of Madhubani (the literal meaning of which is forests of honey) and other areas of Mithila. The painting was traditionally done on freshly plastered mud walls and floors of huts, but now they are also done on cloth, handmade paper and canvas. 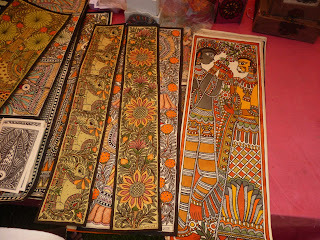 Madhubani paintings also use two dimensional imagery, and the colors used are derived from plants. The colors used were traditionally derived from natural sources like plants, charcoal soot, ochre etc. Black colour is obtained by mixing soot with cow dung.Yellow colour is obtained from turmeric or pollen or lime and the milk of banyan leaves. Blue from Indigo. Red from Kusum flower juice, red sandalwood or rose. Green from the leaves of apple trees, White from rice powder, Orange from palasha flowers. Madhubani paintings mostly depict the nature & deity from the ancient epics. Natural objects like the sun, the moon, and religious plants like tulsi are also widely painted, along with scenes from the royal court and social events like weddings. Generally no space is left empty; the gaps are filled by paintings of flowers, animals, birds, and even geometric designs. Objects depicted in the walls of kohabar ghar (where newly wed couple see each other in the first night) are symbols of sexual pleasure and procreation. After taking our breakfast we attended the work shop of Vidyanath Jha and Chaturang Jha. I was taught by Vidyanath Jha, senior and respected artists of the village, how to draw the Madhubani style of painting. After lunch we left to see the palace of King of Darbhanga. We were quite amazed to see that such exquisite palace exists in such a remote place like this. Later we got to know many things about the King of Mithila. In the evening we attended the programme organized by Banglnatak.com. We heard the song of Bauls (of Bengal,) drummers of Bajashol of Orissa and some local artists also sang. It was jam packed. However there was no commotion. In the morning we went for Prabhat feri or singing around the villages by the Bauls. Then after breakfast we went to the house of the artists. We went to the house of Vidyanth Jha, K Jha Devi and Chaturang Jha. In fact they are extremely warm and offered tea. In one of the houses were offered a special type of black coloured Roti. We got to know that Banglanatak.com is doing great work for the artists. After chatting some time we went to the mela ground to finish our art work - we did yesterday. I bought many paintings today. Then after taking our lunch we left for station. There we met a person and got to know that Darbhanga Raj, also known as Raj Darbhanga and the Royal Family of Darbhanga, were a family of Zamindars and rulers of territories that are now part of Mithila and Darbhanga district, Bihar, India. Their seat was at the city of Darbhanga. The estate of Darbhanga Raj was estimated to cover an area of 2,410 square miles (6,200 km2), incorporating 4,495 villages within 18 circles in Bihar and Bengal and employing over 7,500 officers to manage the estate. It was the largest zamindari in India and was the best managed estate at the time of abolition of Zamindari. The Raj Darbhanga trace their origin to kayastha at the beginning of the sixteenth century.